Now that we’ve gotten through a few more individual character episodes, we’re going back once again for another family-centric storyline. Sorry Marge, it looks like you will have to wait a few more weeks before you get your first episode plot, but trust me, we’ll definitely have some things to talk about with THAT episode. Anyway, this time we’re taking a trip to the great outdoors, and based on what we have seen so far; The Simpsons mixed with the great wilderness…I’m sure that will be a sight to behold. “The Call of the Simpsons” aired on February 18th, 1990 and was the ninth episode written for the series despite being the 7th episode that aired for this first season. This is because the episodes “Some Enchanted Evening” and “The Telltale Head” (which will be our next episode) were written before this episode, but were delayed for one reason or another. In the former’s case, it was because the episode was an animated nightmare, but that’s further from the point here. The chalkboard gag for this episode is, “I will not draw naked ladies in class,” and the couch gag is…there is none. The family just comes in and sits on the couch. No gag. When Ned Flanders comes home with a brand new, top-of-the-line RV for his family, Homer’s “hidden” jealousy for his neighbor’s wealthy possessions kicks in, as he decides to get an RV for his family as well. At the RV dealership, he finds an RV that he really wants to get, but when Cowboy Bob proceeds with a credit check on Homer, he discovers that the vehicle is way out of Homer’s price range. Instead, he hooks Homer up with a much cheaper model that looks incredibly run-down and sounds like it is in bad shape. 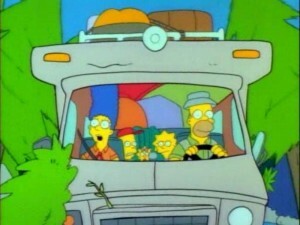 Despite the warnings from Marge, Bob convinces Homer to purchase the RV and Homer decides to take the family on a camping trip with their newest purchase. However, during the road trip, Homer gets lost and drives the vehicle to the very edge of a giant cliff. The family escapes the RV just in time for it to fall over the cliff, stranding the family in the woods, away from civilization. The family sets up camp and Homer and Bart decide to go out and look for any signs of civilization and help, while Marge and Lisa stay back at the camp. Baby Maggie starts to follow Homer and Bart, but when the two mistake Maggie’s pacifier sucking for a rattlesnake, they run ahead and leave Maggie by herself. Maggie eventually meets up with a bear which at first roars in Maggie’s face, but quickly calms down when she sticks a pacifier in its mouth. Maggie travels with the bear and goes back to its family’s den, where the entire bear family takes care of Maggie like if she were their own and brings her stuff from other families camping in the woods. Meanwhile, Marge and Lisa find out that they are quite adaptable when it comes to living outdoors as they manage to make a campfire and some decent shelter for the night. However, Homer and Bart are not having the same amount of good fortune. They stumble into a raging river, lose their clothes, and have a really hard time adjusting to life in the great outdoors. This is incredibly ironic considering Homer is supposed to be an experienced woodsman (at least according to him), but he seems to run into difficulty at every step. When Homer tries to drink honey from a beehive, the stinging of angry bees cause Homer to run to what he thinks is a watering hole, but ends up being a giant puddle of mud. Homer is completely covered in mud and is babbling incoherently from all the bee stings, and during this state, he runs into another camper who mistakes Homer for the legendary “Bigfoot.” The camper gets Homer on film and runs off before Homer can start talking properly again. With news stations reporting on the discovery of Bigfoot, the camp rangers start evacuating families from the premises, including Marge and Lisa who have been found and warned of the Bigfoot sighting. After seeing the tapes, Marge recognizes “Bigfoot” as Homer and tries to talk some sense into all of the reporters, but the reporters start treating her as a crazy lady instead. Homer and Bart eventually find the bear cave that Maggie has been staying at and reunite with their youngest daughter/sister. 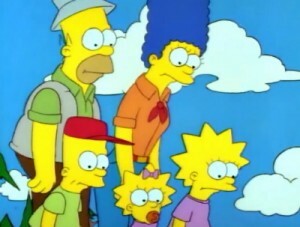 Maggie bids a sad farewell to her new bear family and then they start heading back to where their campsite was. When Homer is located, the camp rangers tranquilize Homer, still mistaking him for Bigfoot, and take him in for extensive tests and analyses. 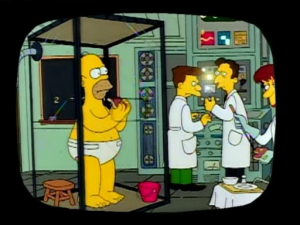 After testing, Homer is let out and is able to go home, where he and Marge watch the test results being broadcasted on TV. From all the testing, it is determined that the results are “inconclusive,” meaning that Homer could very well be the intelligent creature known as Bigfoot, or just a human being with below average intelligence. Homer is incredibly humiliated by the program, but Marge tries to console him with kind, loving words as the episode ends. Much like the episodes “There’s No Disgrace like Home,” and “Moaning Lisa,” this was always an episode that I was very well aware of, in terms of its existence, but could never really recall when I first watched it. I think once again it has to do with the fact that a clip from this episode was used in “So It’s Come to This: A Simpsons Clip Show,” where it basically showed a scene of Homer and Bart in the woods from this episode. The first time I remember watching this episode in full was on the Simpsons Season 1 DVD, but if I had seen this episode prior to that, I honestly couldn’t tell you. Honestly, I don’t have a lot to touch on this time around, so I’m just going to go through the episode and touch on all the major highlights. First off, I have to give a huge shout-out to the very talented Albert Brooks for his voice work in, not only this episode, but in any episode where he is featured. In this episode, he does the voice work for Cowboy Bob, the RV salesman, but most Simpson’s fans will better know him as Hank Scorpio from “You Only Move Twice” and Russ Cargill from The Simpsons Movie. In this episode, although he plays a very minor role, it’s a role that is done very, very well. He was the most excellent personification of a classic used-car salesman and the way he worked over Homer was absolutely fantastic. I have to give major props to any individual who can do that line of work, which requires a lot of stretching the truth and saying the right things, and even though this is a cartoon show, Albert Brooks gives an amazing performance here and I could really get the sense that he knew what the hell he was doing. Homer’s aptitude, or should I say lack of aptitude, for being an experienced woodsman is also a very humorous part of the episode, even if I feel like it can be a bit overdone at times. There is just something funny about how Homer can be so confident about his plans and zany schemes, even though they are so clearly lacking in substance or careful thought. He literally granbs a honeycomb and starts chugging the honey out of it, not even giving a second thought that bees may be around in some way. And honestly, perhaps my favorite joke of the entire episode, is when Homer tries to catch a rabbit with a snare trap, and the trap just flings the rabbit many, many miles away and Bart and Homer just watch the rabbit landing so far into the distance. In fact, I think I’ll include a link to that scene just to show you how great it is. As I said, I’m not too much of a fan of when Homer gets “overly” depicted as a bumbling idiot who can’t do anything right, but in this episode, I think it works because the entire situation was Homer’s fault to begin with. He bought the cheap RV, he insisted on taking the family on a camping trip, and he decided to drive the family through a dangerous wildlife path that was completely off the road map. In other words, he kind of reaps what he sowed. And finally, special mention to the return of the humorous newspaper headlines when Marge is trying to explain to the reporters that Homer isn’t Bigfoot. I always enjoy jokes of that nature and I always remember these one in particular. I think the one that really gets to me is the headline that says “The Bigfoot Diet: Pork Chops Aplenty!” just because it clearly shows that the reporters do not care at all about what Marge is trying to explain and just want to get more shock value or information for the Bigfoot articles, which is just classic humor at its finest. So before the retrospective, I honestly thought this episode would probably be one of my lowest rated episodes from the first season. Watching this back, much like Bart the Genius and Moaning Lisa, I was surprised I actually enjoyed it a little more than I thought it would. I wouldn’t say it’s perfect, or incredible or anything, and I would still probably rate it as one of the least enjoyable episodes from this season, but it’s not unwatchable, which I guess is the most important thing. It just feels like there could have been more jokes. Homer trying to adapt in the woods is the most engaging part of the episode, but they cut away from it a lot to focus on the other parts of the story, which, I do agree are necessary parts of the story, but it’s such a shift in tone that I almost feel like it starts to lose me a little. I think the biggest problem though is that I just don’t really like the “Bigfoot” development of the story. Again, I understand it’s a cartoon show and is not meant to be realistic or logical, but there’s just something about that part of the plot that seems to be “too much” of a stretch, at least for me. And it’s a stretch in the sense of where the episode ends up, because like Homer’s Odyssey, it feels like three different mini-episodes. 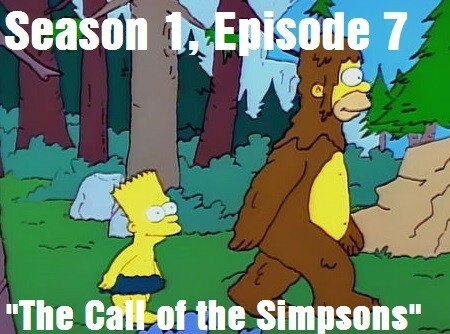 The first episode is about Homer being jealous of his neighbor’s RV, the second is about getting lost in the woods, and the final is about Homer being mistaken for Bigfoot. It’s just really interesting how the episode gets to that particular point and I almost wonder if it could have been done in a different way; a more enjoyable way that could have flowed together better. 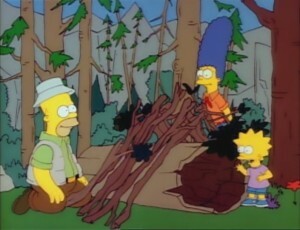 I think an ending where Homer and Bart get saved by Marge and Lisa, who have discovered how to be quite efficient at living in the woods, could have been a more engaging conclusion, and one that would have focused on the entire family a bit more as opposed to the Bigfoot shenanigans. That’s just my take though. I’m sure there are individuals who may defend this episode a bit more than I would, but at that point, it all comes down to personal preference. I definitely don’t think it’s a bad episode by any means, but there are many other episodes I would choose to watch over this one, including episodes in this same season. But yeah, I think that about wraps it up for this episode, so let’s not ignore Lisa’s advice on how to find the North Star and head on home and back to civilization. And with this episode taken care of, we are officially more than halfway through Season 1! We only have 6 more episodes left and…my god, we have some interesting ones to come! Next week we’ll be taking a look at what many Simpson’s fans consider to be a classic Simpsons episode; The Telltale Head. After that, I may be taking a small break since I’ll have a vacation coming up, but when I return, I’ll be hitting the remaining 5 episodes hard because I would like to finish this season before we get to the summer months. Thanks for reading everybody!